Global climate change policy has failed us all, but what is the reasoning that underlies this failure? Why are some people more disposed to reflect on confounding issues like climate change, recognise the danger, seek a solution, and act accordingly, more than others? This book is concerned with how we think and act in response to climate change. In particular, faced with deep uncertainty and the multifaceted complexities that characterise the climate change conundrum, how the various actors and institutions involved in the policymaking process make decisions that both aid and impede in the design and implementation of climate change policy. This book focuses on how these actors and institutions frame and use the knowledge available – under conditions of competing ideologies and interests – and synthesise it to form often-disparate mental models, or worldviews, that inspire them to become firm advocates of meaningful climate change action or indeed, sceptics that continue to downplay the threat, and hence the need for urgency. 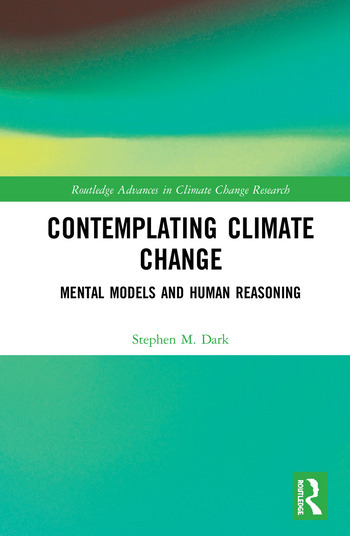 By exploring how we think about climate change and the disparate mental models we hold as a result, this book explores why humankind has thus far failed in its endeavours to solve the climate change problem. This book will be of great interest to students and scholars of climate change, environmental policy and environmental psychology. Stephen M. Dark is a Semester Teaching Fellow at Bond University, Australia, and holds a PhD in Environmental Epistemic Cognition.